What is so unique about Duddell Street? It took me almost 20 months to figure out that there is something unique about Duddell Street, a small street that I have walked past so many times already… on the way to the Hong Kong Park, back from the Peak tram, a work lunch with Patrick (back in 2011 his office was located in the Citibank Tower) etc. But I never noticed that there is something very unique about this tiny street. It’s not the huge Shanghai Tang flagship store that’s unique (they moved there after the company was outbid by Abercrombie & Fitch for its Pedder Building) but something else, right at the end of the small street. There is a staircase with four lamps. Nothing special you would say? Well, not true. 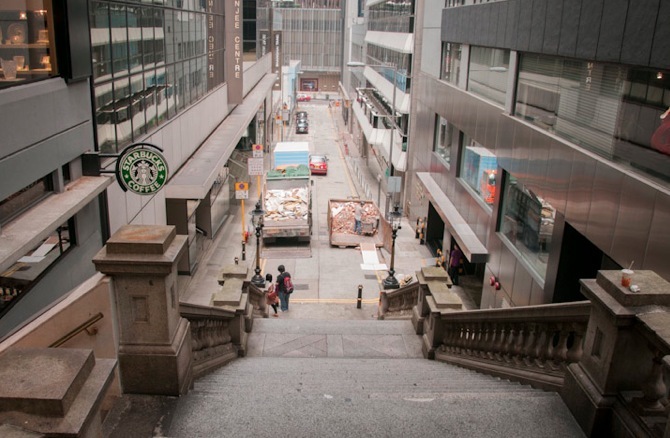 These four lamps are the last gas lights in Hong Kong. 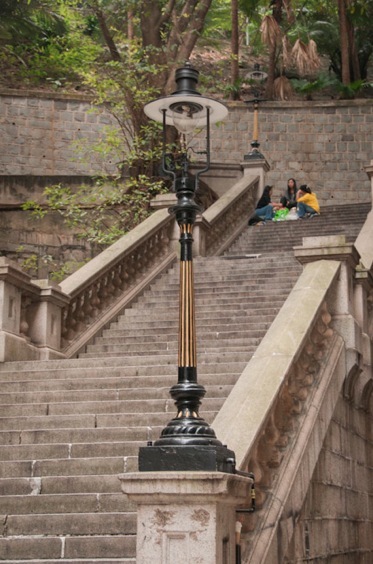 The steps were built between 1875 and 1889 and the gas lamps surmount the balustrades at the top and foot of the steps. 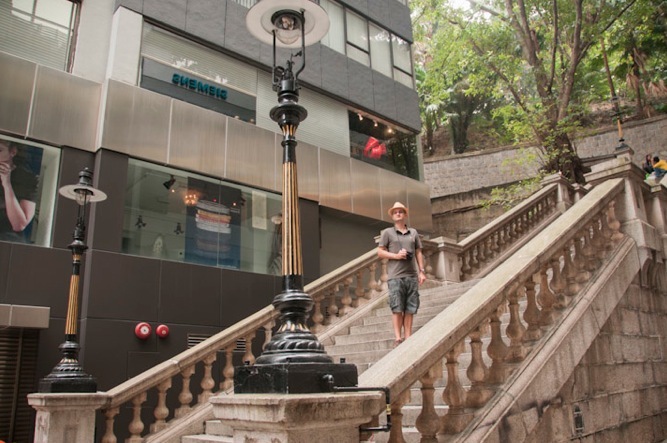 Hong Kong had many other gas lamps, these being mounted on the balustrades were shorter than the regular street ones. 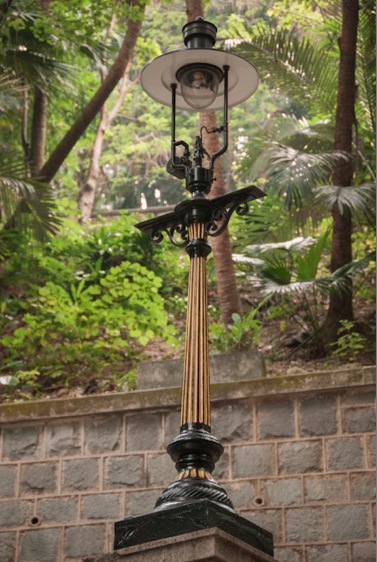 Gas lamps like these were popular as they did not require nightly lighting and extinguishing in the way the previous kerosene lamps did. After World War 2 gas lamps were steadily replaced by electric lights throughout Hong Kong though these four at Duddell Street have remained and are still maintained by TownGas and come on every night (between 6pm and 6am) to give a slight flavour of what gas lit Hong Kong must have been like. What amazes me about these lamps and this staircase is that they have survived for so long. This is in a city where any building older than 10 years is considered past the use-by date. 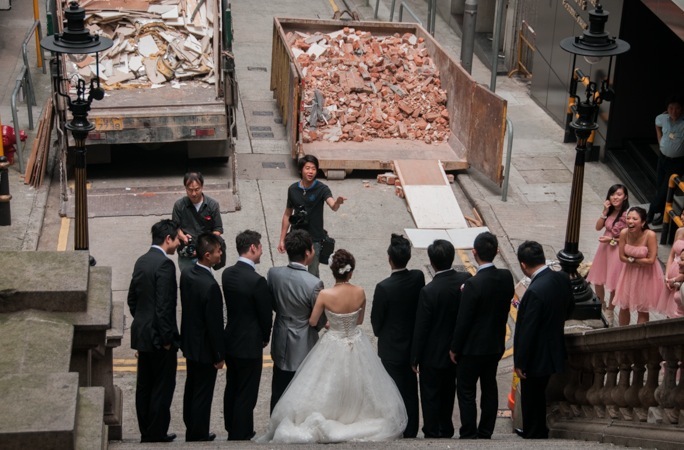 For some reason Hong Kong people have nostalgia about this staircase, and for the few minutes we were there, we already saw one wedding photo shoot taking place and I am sure there must be many more every day!